My first Manowar album and I’ve been trepidatious to try them ever since. 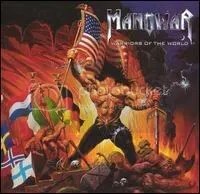 This is regarded to be one of the worst Manowar albums. For someone who’s never heard a Manowar album before this one, I’ll say it’s just pretty average. There’s going to be some absurdity in every Manowar release, but “An American Trilogy”? Really? Just way too many soft spots where Manowar forgets they’re a metal band and begin think they’re at the opera. I will say that Eric Adams does have an impressive voice suited for either metal or apparently, the opera, but who wants to listen to opera? Not me. After all this, I considered picking up the band’s 2007 release “Gods of War”, but the reviews for that album are even worse than reviews for this one.